Copyright © 2004, P. Lutus. All rights reserved. At first glance, Alaska is simply one of 50 states that comprise the United States. But when you actually visit Alaska, over time it comes to you that this is a foreign land, with rules and customs of its own. 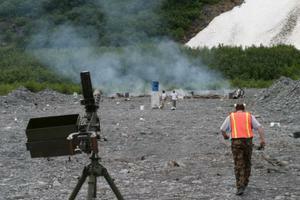 I want to present a somewhat extreme example of how different Alaskan culture is, but I don't want to cause any trouble for the people in a certain gun club I visit, a club whose members, apart from a consuming passion for automatic weapons and explosives, seem entirely respectable and law-abiding. So I'll limit myself to pictures that don't show people's faces (see this page) and I won't say where this club meets. I hasten to add that this club is entirely legal, in fact it seems several members are police officers. After 9/11, things have tightened up a lot in the lower 48. For example, you shouldn't expect to be able to drop into a hardware store and buy explosives across the counter. But in Alaska, it seems you can do this. I wasn't there when the purchase was made, but I certainly saw the result. A full day of — well, how shall I say this — blowing things up by shooting at them. I would love to have been present during the explosives purchase, although I can imagine the conversation. "Hello, do you have any explosives we can set off by shooting at them?" "Whoa. Hold on. I can't provide anything like that unless you meet certain very special requirements." "Okay, we're all members of a machine gun club." "Hey, okay, why didn't you say so!" I arrived late on the day of the club meeting, so I only saw the end of the festivities. The club had pretty much run out of things to blow up (as well as ammunition to set off the explosions), but there were still a few things not in pieces. In the pictures on this page, you can see a couple of guys putting a 55-gallon drum on top of a refrigerator that had been a target earlier in the day. 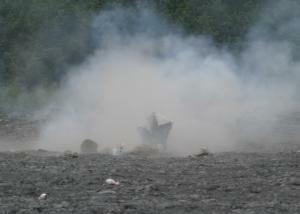 The drum holds what's left of the day's ration of explosives. 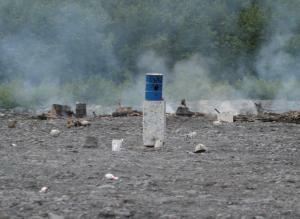 After the range was cleared of people, everyone who still had any ammunition began shooting. I started clicking my shutter. Within about ten seconds, one of the rounds nailed the barrel just so, and it completely disintegrated. As you can see, even the refrigerator the barrel stood on got split in two. You may ask, how is this possible? How can a group of civilians do this post-9/11? Isn't this a throwback to the Wild West? All I can say is, it's not a western movie, it's Alaska. I want to add that the people in this club are completely reasonable and normal (as machine gun owners go), people who on any other day would probably escape your attention. Also, apart from how peculiar this activity may seem to the post-9/11 world, I think I know what kind of reaction this page might produce — isn't this all rather dangerous? Bullets flying around, things blowing up? But I assure you, a legitimate comparison of risks would show that being on a freeway is a lot more risky, because unlike this club, absolutely anyone can drive a car and get on a freeway, including (as so often happens) people who have had their licenses revoked but who simply must get somewhere. This club, like most gun clubs, and perhaps contrary to outward appearances, is a tightly run ship. All the members understand the risks and the rules. 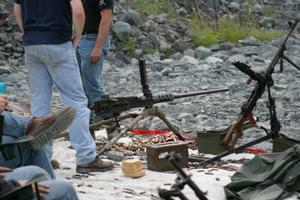 In a gun range like this, the rules are strictly enforced, usually by those with the most experience. There are sanctions for those who can't seem to get their minds around the concept of range safety. Also, there's no chance that a club like this will stay secret for long. These guys make way too much noise firing, say, eight large-caliber machine guns at once, followed by an explosion I was able to hear from five miles away. Which suggests that Alaska, many things for many people, is also where perpetual boys actually do some of the stuff they imagined doing when they were twelve.